We’re very excited to announce the release of the “Health Science” theme for OJS 3.1.1, freely available to anyone to use or modify for their journal. Created by graphic designer Sophy O and built by developers Vitalii Bezsheiko and Nate Wright, this new theme was conceptualized with the Health Sciences in mind, but can, of course, be used for journals in any discipline. You can make several changes to the theme through the Website Settings on the Appearance tab, including changing the primary colour (currently light blue), revising the sidebar blocks (which appear at the bottom of the page on this theme, just above the footer), adding footer text, adding a home page image, uploading a custom stylesheet to tweek some of the theme choices (like fonts), and more. If you decide to use this theme, or use it as the basis for your own unique modification, please tell us about it in the comments below. We’d also welcome your suggestions on how we could improve this theme. 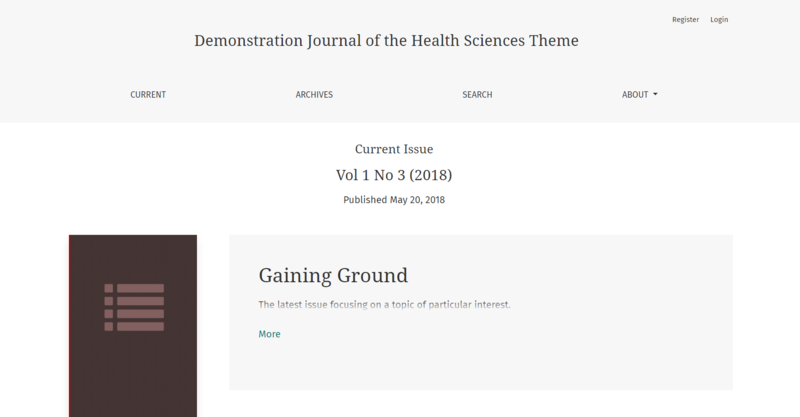 This is just the first of more free themes to come from us, and we also hope it will inspire others to create great looking new OJS themes for their journals, and for others to modify and use. Watch this space for the announcement of the “Humanities” theme very soon! One Comment on "New OJS Theme Available"